Good morning! It is a freezing cold, windy day in Minnesota. Did you watch the Oscars last night? I thought it was a really good show this year. Did you know I am a sale's rep for Marie Mayhew? http://www.woollysomething.com/ She designs all sorts of amazing patterns. They are so much fun to knit. 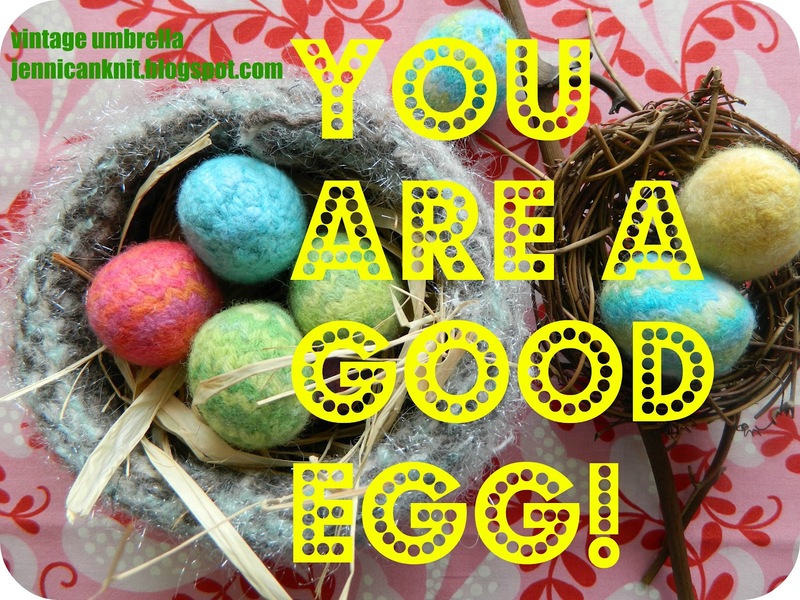 I know Easter is more than a month away, but I've been knitting these little eggs like crazy. The flat little egg doesn't look very exciting until you stuff it and felt it... they come out adorably cute! This photo shows felted and unfelted eggs. I looooove these colors... cascade 220! They look cute nestled in a little bird's nest... you can buy one at the craft store, or knit your own, using Marie's pattern. The nest below isn't felted yet, but I just love the colors! I will share it soon. Guess what I have on the needles now? Knitted bunnies!! I just love this project. I found you over at Sew Can Do and I am now your latest follower. I want to do something similar with crochet. I just have to figure out how to do it. I especially love the felted ones you made. Great job. I love those eggs! So unique with fabulous texture! I'm in love with these eggs, Jenni!!! They are SO cute!!! These are SO charming!! I saw you on the American Crafter auditions. Good luck! Totally adorable! I'm already getting into Easter crafts, too! I'm curious how you made the felted ones, do you have a tutorial or could you point me to one? I really don't know where to look... thanks! It gives great instructions for knitting and felting eggs. Have fun!